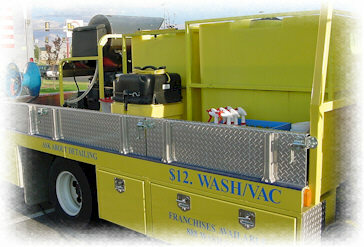 WashGuys Set Sites on Idaho Market. WashGuys have been watching the Idaho Market Carefully after establishing franchises in Northern Idaho three years ago. We have surveyed the competition too. Not much to worry about there. Here is a competitor in the Twin Falls Area. He says he services Twin Falls, Rupert, Burley, Heyburn, Jerome, & Buhl areas. We asked him how business was. He said it was "SSSLLLOOOOOOOW !!!" Interesting considering the population in the area is quite good and growing. We talked to his biggest area competitor who had a small unit he towed behind his Nissan Pick-up who washes car lots for seven of the areas largest dealerships. 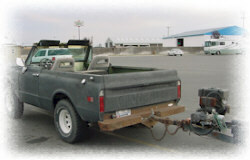 We took a closer look at his rig as he parked out side of the Wal-Mart in Burley, ID. And noticed that he does not seem to respect animal rights. Something our team is very much into as you can see on our Industry-Wide Famous Car Wash Pets Pages, with the newest Pet from Reno, NV, the great "Bogey" friend to many golfers. We believe in treating animals very well and that any crimes to animals far surpass other crimes. 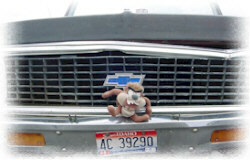 Terrorizing Helpless animals like the endangered "Tasmanian Devil"
We realize that in Idaho it is very difficult to drive year after year without hitting a Dear. But we imagine this guy does not slow down judging by his front bumper and bad attitude towards our fellow species. As we started to look over his tow vehicle we noticed a few dents. We at WashGuys are very much against Drunk Drivers in any state and we realize that countless Americans each year are killed by Drunk Drivers. The numbers are staggering and what many fail to realize is that we have had more drunk driving deaths in our country than Americans killed in W.W.II. In 2001 a relatively light year for drunk driving deaths, there were 16,653 official deaths from drunk driving and 1000 from drunk boating. Unofficially there were many more contributing deaths from drunk driving where it was a partial factor. We are the only franchise with a clause in our franchise agreement that if you drink and drive in a Car Wash Guys Truck you automatically can lose your franchise, here is the clause. 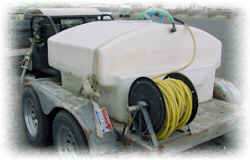 You agree not to drink and drive a mobile car wash truck of your franchised business on a public highway when you may be over the legal limit of toxicity. You also agree not to drive your personal vehicle in the manner described above. Such violation of the law resulting in the conviction of a felony or misdemeanor is subject to termination of your Franchise Agreement. We have always supported local groups such as MADD and DARE and Nancy Reagan's "Just Say NO !" Programs in the past, because we believe that this type of behavior sets a bad example to young people. We must lead by example to insure a strong up and coming generation to lead us in the future. In Lewiston, ID we had a competitor who was selling drugs out of the back of his car wash. It was common knowledge in town. This is unacceptable. WashGuys have always been on the leading edge of important issues concerning peoples of our countries, this is why our Franchise System and our team Members have agreed in advance to not park in or block handicap parking spots. We are so serious about such abuses to the common good of the Physically Challenged that we have made it a part of our franchise agreement. We are the only franchise in the history of the World to make this an issue in our franchise agreement. We mean it when we say we believe in the highest standards of conduct and respect for the communities we service. 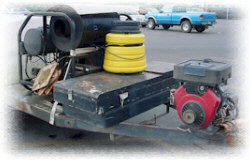 As you will note there is no "Handicap Placard" on this competitors tow vehicle. We therefore asked him to kindly move his vehicle and park somewhere else. He did, and then we took more pictures. We believe in image and cleanliness. How can you sell cleaning services when your equipment is ratty looking, it shows a complete disrespect for the customer. Image and cleanliness were issues brought forth by some of the leaders of Franchising, such as Ray Kroc of McDonalds and Tom Monhan of Dominos Pizza. That tradition in franchising helps build brand loyalty and shows respect and pride in your work. When Fred Smith started Federal Express, now simply Fed Ex, re-named by the customers, he showed respect by insisting that all delivery vans be pressure washed nightly. If you look at the manual for a Starbucks, 1/2 of it is not how to make coffee, it is about customer service, cleanliness and image. Why? Respect for the customers, employees and Brand Name. Obviously this competitor believes Brand Name is not important. So much so that he does not have a name on the vehicle or trailer. At least he could have painted his rig? Any color really. Heck, he could just paint it white with a blue stripe and put Plain Wrap-Pressure Washing. Anything but this image. Not only does it degrade the entire industry full of reputable practitioners, but it is degrading to his self. And without a top on his vehicle everyone can see who is driving. Of course he does not need to take a shower in the morning he can just drive around and pray for rain. Here is the first paragraph of the first chapter of the WashGuys Confidential Operations Manual. The entire set of manuals at WashGuys is over 1000 pages. The single easiest way to increase sales is to look professional. People believe what they see. If you look the part, you get the part. 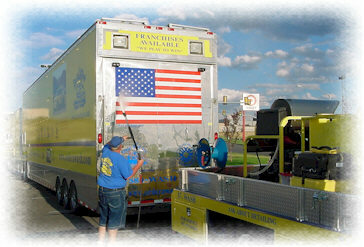 We at franchise headquarters have gone overboard with every detail. If you havent noticed, everything is a bright shiny yellow. The trucks, flyers, shirts, hoses, vacuum - YELLOW!! The rest is either blue or silver. We are committed to keeping a positive image in the mind of every customer. 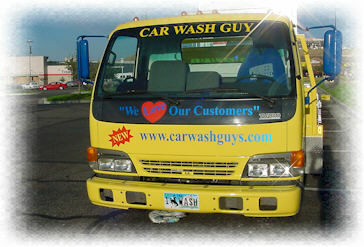 As you are probably aware, Wash Guys has never sacrificed its high public image for money. What you may not realize is that a high public image may not cost as much as you are led to believe. In the service business, image is fifty percent (50%) of your business. The impact you have on your customers, whether it be your appearance, cleanliness of your equipment or style of your classy color brochure, is forever being re-audited. Even if your first impression is great, you can lose it just as fast if you fail to handle simple details. Here are a few areas that are the cornerstone of your new image. Image in Business are so important, especially in the service business, so when we see competitors in any market who disregard image and still are able to get business, we realize that WashGuys in such a market is an absolute no-brainer. 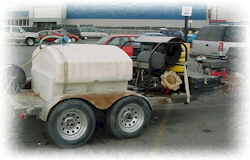 There are many problems in the Mobile Washing Business with the competition and we are cleaning it up, city by city, state by state. Both figuratively and literally. Just like Sam Walton, Ray Kroc, Tom Monhan, Michael Dell, Fred Smith and countless others have in their industries. We will seize this opportunity to bring quality, image, cleanliness and service back the customer who has clearly been forgotten in the State of Idaho. WashGuys Believe in First Class Image. Wyoming Wash Guys takes it personal. 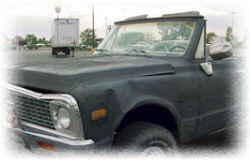 Notice the license plate "1 WASH" Wyoming. I guess that about says it all. 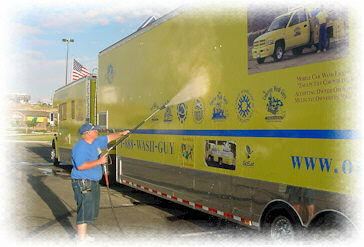 Not only are WashGuys Number on in Wyoming but this is the first Wyoming truck proving that we are number one. In Casper, Wyoming we became the number one mobile car washing and detailing service in the city within 2 weeks, proving that there will be nothing stopping this team in their pursuit to keep the state clean. If you will notice how perfectly clean their rig is and how it shines like there is no tomorrow, you will understand the level of dedication that goes into their business. It is not everyday that a business walks the walk. Not only is their image perfect, but so is their work. Here we see them doing a most excellent job on the Corporate Command Center as "Jimmy" sprays the Exhibit truck and prepares it for soaping. Notice their strict adherence to water conservation. Using only the amount required to rinse the vehicle for soap. Followed by just enough water for the final rinse without wasting any. Although Casper, Wyoming is not in a drought situation our team is careful to conserve this precious natural resource. Our team believes it is every businesses responsibility to serve the residents and their needs while they make money. This serves the common good by allowing them to provide more jobs for the community and mitigate any impending drought in the area. A county commissioner who invited Rock (Wyoming WashGuy) to join his Kiwanis Club told us that water supplies were good and should get them through till Winter, but come Spring it could be a whole new story, he said conservation and reasonable water usage are the key.